We are proud to announce NDP's new one-on-one mentoring program! We are seeking Expressions of Interest (EOI) for participation as mentors or mentees. Mentors and mentees will define their own schedule of activity, but ongoing contact of 30 minutes once a fortnight will be encouraged (at least four points of contact throughout the intake period). The program will primarily be delivered online, however some face-to-face options may also be provided. All training will be provided prior to the start of the program. 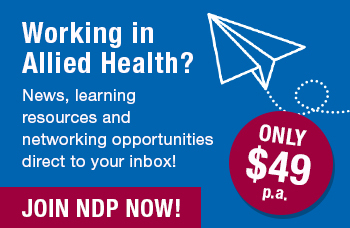 This opportunity is available to all NDP members nationally. Not a member yet? Join today!